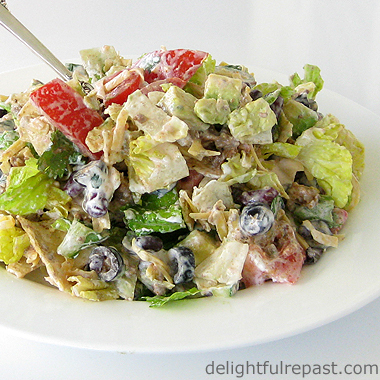 Taco Salad is one of my favorite easy breezy meals for summer. All the benefits of tacos, without any of the drawbacks. It tastes like tacos, but you can make it several hours or even a day ahead, with no last-minute frying of tortillas and fussing with filling individual tacos. On those too-hot-to-cook days, you can fry up the ground beef in the cool morning hours and assemble the salad at your leisure, pop it in the fridge and forget it. Bring it out for everyone to admire before you mess it up. If you fill it to the brim like I did, you'll need to dump it into an even bigger bowl for tossing with the chips. It's such a satisfying one-dish meal I, the breadaholic, do not even need bread with it (or my homemade flour tortillas)! It's just as good with ground turkey, and vegetarians can leave out the meat altogether. Add green onions, bell peppers and corn, if you like. This was made with almost all organic ingredients. Do you feel it's important to buy organic food? Another question, since summer is on its way: What is your favorite busy-day, too-hot-to-cook dinner? 1 In a medium skillet, heat oil and add the ground beef. (If you're using a fattier ground beef than I do, you won't need the oil and you will need to drain the fat off after cooking.) Cook, breaking it up, until very well browned. Stir in the chunky salsa and continue cooking until most of the liquid has evaporated. Taste and adjust seasoning. Chill until ready to assemble salad. 2 Whisk together the dressing ingredients. Taste and adjust seasoning. Chill until ready to assemble salad. 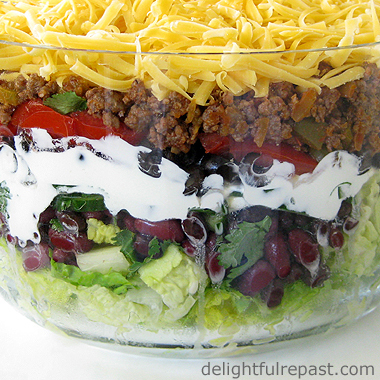 3 In a large bowl, like this very inexpensive straight-sided 5-quart glass salad bowl, layer ingredients. If you don't care about presentation, you can use just any large bowl. But I've found that dinner guests enjoy looking at the layers before the salad is tossed, so I use a clear glass bowl that has straight sides and is about 9 inches in diameter and 6 inches deep. Of course, when I fill it to the brim there is no room in that bowl for tossing, so after everyone admires it I dump the salad into an even larger bowl for tossing. 4 It doesn't really matter in what order you layer the ingredients, but I like to put the romaine on the bottom and separate it with a layer of sour cream from ingredients I want to salt; that way the lettuce will stay crisp until serving time. Throw a handful of cilantro over every layer and sprinkle a little salt and pepper over the bean, cucumber, tomato and avocado layers. 5 Gently toss the chopped avocado with the lemon or lime juice. Make it the last vegetable layer. Spread the dressing evenly over the avocado layer. Top with the shredded cheese. Cover and refrigerate until serving time (anywhere from 2 to 24 hours). Bring it out for "presentation," then dump it into a very large bowl, throw on as many handfuls of white corn tortilla chips as you see fit (breaking them up slightly), toss and serve. We recently had to make an unexpected trip to a little town in northern California, so I looked on the map to see how far we would be from other interesting destinations. Turned out, Napa Valley was quite close! Sacramento International Airport made the most sense for our itinerary, but San Francisco, Oakland and Sacramento international airports are equidistant (about an hour) from Napa; so take your pick. Update 10/13/16: Just posted another Travel Review - Napa Valley, featuring different places. We checked in at our hotel, Westin Verasa Napa, on the riverbank in downtown Napa. We selected the Westin because of its proximity to the Napa Valley Wine Train and the Oxbow Public Market* as well as for its own features. I never really relax and enjoy a vacation unless I'm staying in a really nice hotel with really good food nearby! Our deluxe king room at the Westin more than met my requirements for a hotel room: spacious, clean, quiet, well appointed, pleasant view. This room had things I didn't even get around to using! It had an in-room kitchenette with granite countertops, refrigerator, microwave, cooktop (yes, I said cooktop! ), sink and dishwasher (that's right, dishwasher! ), as well as cupboards full of dishes, flatware, cookware and utensils. But with so many good things on the menu downstairs at the Bank Cafe and Bar and just down the street at Oxbow Public Market, I was not going to be doing any cooking. Bank Café and Bar had seriously good food, and one of my favorites just happened to also be vegetarian and gluten-free. 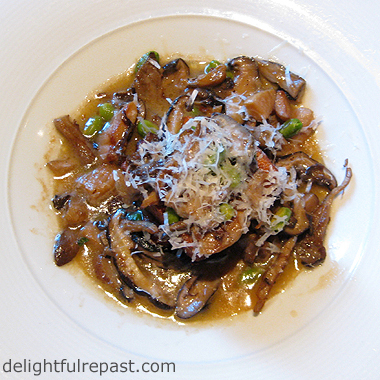 It is called Panisse Cake and is topped, as you can see below, with lots of seasonal mushrooms. The large pool, perfect for even serious lap swimmers (I'm a dry-hair bobber myself), and the hot tub are in a beautiful setting which includes cabanas for shade-lovers like me. Just outside the pool area is the lovely riverwalk along the Napa River. 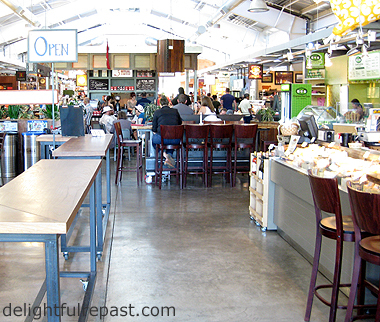 * Oxbow Public Market (photo below) is rather like a rustic, upscale, non-chain, slow food, newfangled food court where you can dine--seafood, crepes, Mexican, Italian, Venezuelan, et cetera--inside or on the riverfront patio or buy fresh meat, charcuterie, cheese, tea, coffee, spices, olive oil, wine, chocolates, tableware, all sorts of fabulous things. The next morning, we walked across the street to the Napa Valley Wine Train. Checking in was a breeze and the charming station is a comfortable place to wait for the antique train. You can even taste wine before departure. We perused the gift shop so we could make our purchases quickly when we got back to the station. The staff, both in the station and on board, clearly love what they do. There are several options. Ours was the Castle Tour, for which lunch service is completed on the trip up valley since the return is by motorcoach. We were seated at a table with a lovely couple from Cincinnati who were kind enough to rearrange their seating so that I, being prone to motion sickness, could face forward. Turns out, I did not have even a tiny problem! I don't think anyone on the whole train had a problem. Everyone looked healthy and happy! There is a wine tasting bar on board with dozens of wines to choose from, but I was so comfy and lazy I just had wine at the table. I enjoyed looking at the kitchen cars. Can you imagine cooking and serving on a moving train--I'm sure I'd be fired on my very first day! 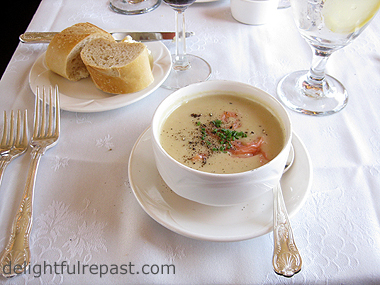 My husband started with a salad that he declared delicious, and my roasted cauliflower soup with smoked salmon garnish was exceptional. I liked it so much I would have been happy to have another bowl with their excellent bread and call it lunch. 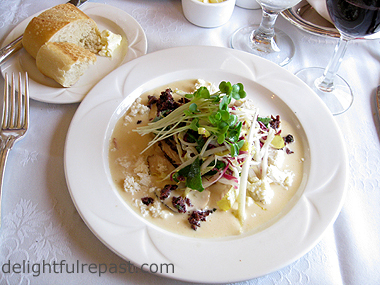 We both chose the chicken main course (Coriander Mustard Encrusted Breast of Chicken topped with Endive-Radicchio‐Feta Salad in a Citrus Beurre Blanc), the couple from Cincinnati had the pork and the couple across the aisle from us had the beef. We were all very pleased with our choices! The restrooms on board were a pleasant surprise, small but not cramped (nothing like those on airplanes) and had a basket of cloth towels rather than paper towels. I was impressed--one of the many ways the Wine Train exceeded my expectations! Those of us who would be leaving the train up valley for winery tours moved to plush swivel chairs in a lounge car for dessert. We had the crème brulee topped with fresh berries (wonderful!) and our new friends from Cincinnati enjoyed (she said "inhaled"!) the chocolate dessert. Fourteen of us disembarked at St Helena and boarded a very comfortable shuttle to Castello di Amorosa, a must-see winery in Calistoga. Even if you're not a wine drinker, this is a place that puts the "sight" into "sightseeing." The owner's fascination with Italian medieval architecture led him to begin drawing the plans 19 years ago. The original plans kept expanding until the castle, built over more than a dozen years using old, handmade materials and ancient techniques, reached its current 121,000 square feet. The photo at the top of the post is a vineyard view from the castle wall. 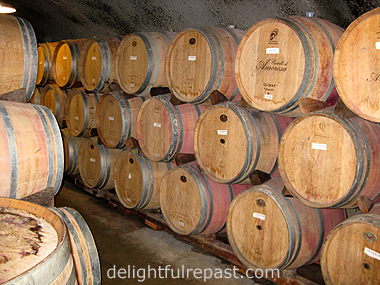 The last, French oak barrels. We tasted about twenty wines and learned a lot from our enthusiastic and knowledgeable tour guide. You can read my Castello di Amorosa Sangiovese 2009 Napa Valley review here, and I'll be writing about others over the coming months. We want to go back to Napa and do it all again! Disclosure: Though parts of this trip were comped or discounted, I assure you that does not alter my opinions. Super Simple Sourdough. There's nothing really difficult about sourdough. Making a sourdough starter is straightforward enough, but unless you're making a loaf or two every week, keeping a sourdough starter going is more trouble than keeping a cat! Update 18 Dec 14: If you'd like to make true sourdough bread with wild yeast, here's How to Make Your Own Sourdough Starter. 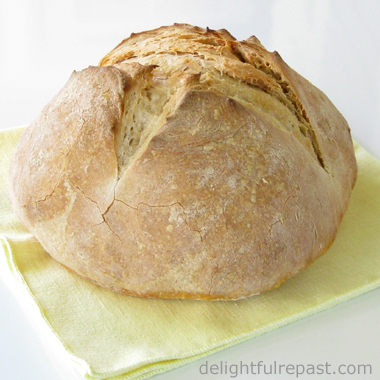 So I developed this easy method that works beautifully for those of us who just want to make the occasional loaf of sourdough. (I'd enjoy making bread everyday, but I'm a breadaholic, so it could get ugly.) Don't let the "72-Hour" bit scare you off. That's just the amount of time it takes to go from "I'm in the mood for sourdough" to your dinner table. You don't have to do much of anything during that time. You don't need a heavy-duty stand mixer or strong arms for kneading. The only special equipment you need is either a pizza stone or the cast iron pan I use as a pizza stone. Now I'm going to sound like a shill for Lodge Manufacturing Company, but they haven't paid me a dime or given me a thing! 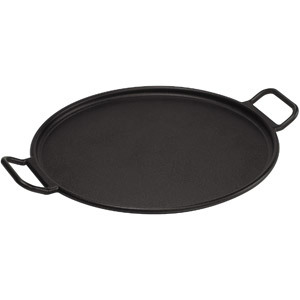 Their Lodge Pro-Logic 14-Inch Cast Iron Pizza Pan is a wonder. If you don't already own a pizza stone (or you need to replace your pizza stone because it cracked, as they will do), get this pan instead. Read Make "Real" Pizza at Home, Part One (my very first post on this blog!) to learn more about it. Lodge simply uses it like a pizza pan, but I use it like a pizza stone. 1 Prepare starter 72 hours before you plan to serve the bread. 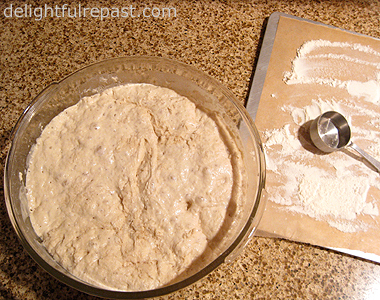 In 1-quart bowl, stir together flour (I use Bob's Red Mill organic unbleached), yeast and water. Cover and let stand at room temperature for 24 hours. 2 After 24 hours, stir in the additional flour and water. Cover and let stand at room temperature for 24 hours. 3 Start final dough 24 hours before you plan to serve the bread. In medium bowl (I use a straight-sided 4-quart glass bowl so I can easily tell when the dough has doubled), whisk together flour, salt and yeast. Add starter and water to flour and stir with dough whisk or large spoon until dough just comes together into a shaggy dough (fairly stiff, but still sticky). Cover with plastic wrap and let sit 19 hours on countertop. 4 Place a square of parchment paper on a rimless baking sheet (which will act as a "peel" later). Sprinkle 1/8 cup flour over the parchment. 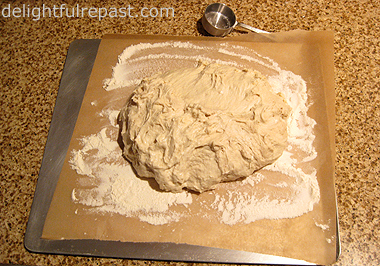 Scrape the dough out onto the floured parchment. 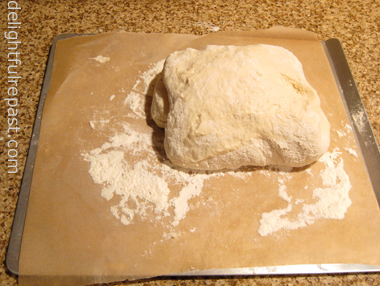 Put a little of the flour on top of the dough and with floured hands, press dough lightly into a 10-inch square. Fold it in thirds like a letter; then fold that rectangle into thirds, forming a square. Pick up the ball of dough and tuck the edges under, forming the dough into a smooth ball. Place the ball back on the parchment. Turn a large glass bowl over it, or cover it loosely with an oiled or cooking-sprayed piece of plastic wrap. 5 Let rise until doubled, about 1 1/2 to 2 hours. It will spread as well as rise and not appear to rise very high. Not to worry! It will rise in the oven (called oven spring) and be a lovely, well-risen loaf. 7 Brush the excess flour off the parchment, cut a "+" about 1/4-inch deep on the top* and slide the boule on its parchment square onto the hot stone. Reduce temperature to 425. Bake for about 45 minutes, or until crust is beautifully golden and middle of loaf is 210 degrees. If it's getting too brown, cover loosely with foil. 8 Remove from oven, using the rimless baking sheet or pizza peel to lift the boule off the pizza stone. Let cool on wire rack for 1 1/2 hours. If not eating right away, you can re-crisp crust at 350 degrees for 10 minutes. 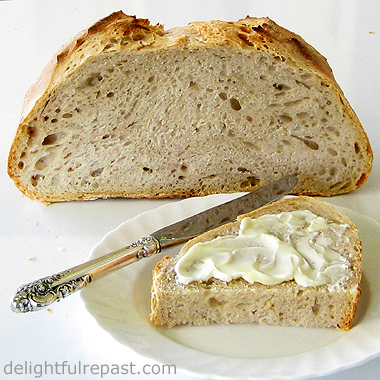 It's best the day it is baked but can be kept, wrapped in foil, at room temperature for up to 2 days (makes great toast). Makes one loaf. 9 My favorite way of slicing* a boule is to cut the loaf in half, turn the cut side down and slice, but you can make long slices if you like. * Note: Use a very sharp knife to cut the "+"--I use my Wusthof Classic 3-1/2-Inch Paring Knife. For slicing, I use my Wusthof Classic 10-Inch Bread Knife. This is Spring on a Plate! I love spring, also known as Asparagus Season. Or Pea and Peapod Season. These are such a treat for me every spring because I refuse to buy the out-of-season imports the rest of the year. That's the thing I love most about seasonal cooking -- it restores the pleasure of anticipation! And no herb says "spring" quite like fresh dill. Those things were what I had in mind when I developed this recipe about ten years ago for a magazine column I was writing. If you like pasta, you probably like any pasta shape at any time of the year. 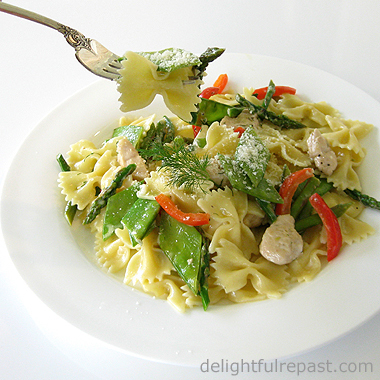 But, for some reason, when spring rolls around I think of farfalle (Italian for butterfly), also called bow-tie pasta. With spring vegetables and a little chicken in a subtle sauce, this one-dish spring meal takes just 45 minutes from start to finish. This batch was a little too heavy on the pasta. The farfalle came in a 16-ounce, instead of 12-ounce, package and I wrongly decided to use it all. Next time that happens, I'll take out a fourth of the pasta and store it. I wish all the brands would get together and decide on package sizes they would all use! Which reminds me of something that really bugs me -- making packages smaller rather than raising prices. Does that bother you? Or do you have other pet peeves? 1 Forty-five minutes before serving time, start heating 4 quarts water with a tablespoon of salt for cooking pasta. Prepare ingredients. 2 Five minutes before adding pasta to the boiling water, start sauce. In 12-inch skillet which has a lid, heat olive oil. Pat dry the chicken pieces and season with 1/4 teaspoon each salt and pepper. Add to hot oil and cook, stirring, over medium-high heat until browned, about 5 minutes. 3 Add minced shallot and continue cooking for a minute or two. Add wine and deglaze pan. Add asparagus (except tips), pea pods, red bell pepper and 1/4 teaspoon each salt and pepper. Cover and cook over medium heat until vegetables are nearly crisp-tender, about 2 or 3 minutes. 4 Uncover and stir in asparagus tips, cream and dill. Simmer gently for 2 minutes. Stir in Parmesan. Taste and adjust seasoning. Pour over hot, drained pasta. Mix well, divide onto four warm plates, and garnish with more dill and Parmesan. Comfort food, Italian style. 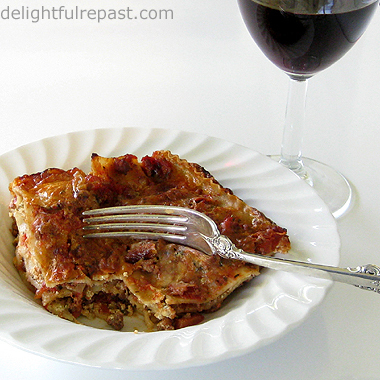 Everyone I know loves lasagne, and I used to make it quite often. So when I perused my Recipes index page to decide what to post next, I was shocked to discover that lasagne wasn't on the list. Then I learned I'd not even put my recipe where I've been putting them for the last five years, so that means I haven't made lasagne in at least five years. That's just crazy! 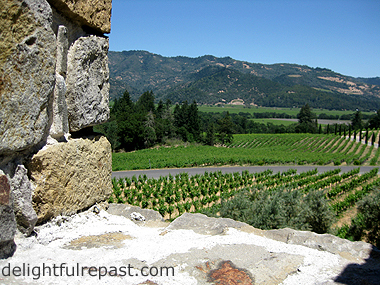 Castello di Amorosa Sangiovese 2009 Napa Valley* is a medium-bodied red wine with a nice balance of fruit and oak. Its dryness and excellent acidity make it very food-friendly and a perfect match for the tomatoey meat sauce. Poured a glass, swirled, smelled, tasted, liked it. Reminded me of tart cherries. Waited 10 or 15 minutes to let it "breathe" a bit, tasted again, liked it even more. Juicy. Then I tried it with the lasagne. Too often with such dishes, I've just gone with a lighter-bodied red I happened to have on hand. Never again! But back to the lasagne. I think it's always better when assembled the day before it's baked and served. Since it's not going into the oven right away, I like to completely cool the meat sauce before assembling the dish. If you want to really make it ahead, cover the unbaked lasagne with plastic wrap and then with aluminum foil to freeze for up to a month. Then thaw it completely before baking uncovered. 1 In large skillet, heat oil and cook chopped onion for about 5 minutes, or until very soft. Stir in minced garlic and cook for about half a minute. Add ground beef and cook, breaking up the meat, until it is well browned. With extra lean ground beef, there will be no excess fat to drain off. Stir in the tomato paste, cooking for a few minutes to "toast" it. Stir in remaining sauce ingredients. Bring to a simmer. Simmer, loosely covered, for about 30 minutes. Remove the bay leaf. Taste and adjust seasoning. Let cool at room temperature for 30 minutes, then cover and refrigerate for at least one, or up to several, hours. 2 In large pot, bring 4 quarts of salted water to a boil. Cook pasta according to package directions. Drain and rinse in cold water. I leave the noodles in a bowl of cold water as I'm assembling the dish. 3 In 1-quart bowl, combine ricotta, Parmesan, egg, parsley, nutmeg and milk. The milk is just to give the filling a spreadable consistency so you have even layers of filling instead of big blobs. 4 Lightly oil a 13-by-9-by-2-inch baking dish. Spread 1/4 cup or so of sauce over the bottom of the dish. Lay on a layer of lasagne, the number of noodles will vary with different brands. With my favorite brand, Bionaturae organic whole wheat lasagne, 4 noodles laid widthwise cover the pan. Spread with 1/3 of the cheese filling, 1/4 of the shredded mozzarella, then with 1/4 of the sauce. Repeat twice for three layers. Add a fourth layer of lasagne. Cover the top layer with the remaining 1/4 of sauce and mozzarella. 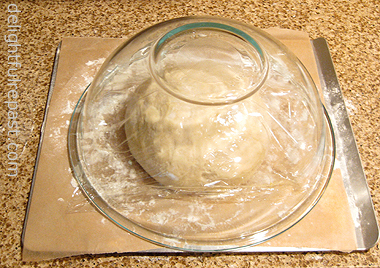 Cover with plastic wrap and refrigerate until an hour before serving time. 5 Preheat oven to 375 degrees. Bake at 375 degrees for about 45 minutes, or until crusty and bubbly. Let stand for 20 minutes before slicing and serving. * Disclaimer: The wine was sent to me free of charge for sample purposes. All opinions are my own. 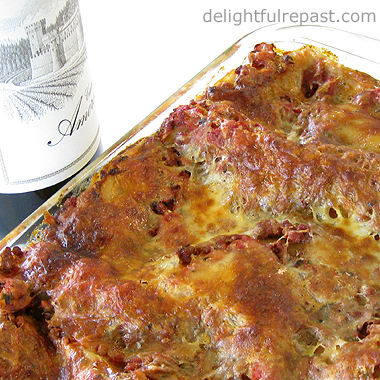 Note: You'll want a nice crusty, chewy artisan bread to with the lasagna!